The 1984 event was held at UKZN in Durban. GM Michael Stean won the event. Spectators could follow the top games on the display boards on the wall, as each move was made by a skilled operator! 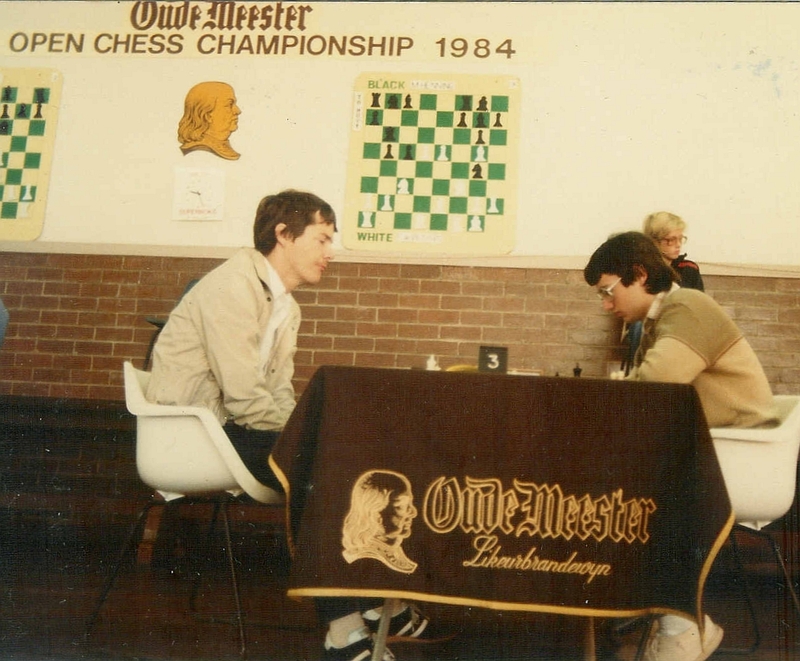 Oude Meester sponsored quite a lot of chess events in South Africa in the 1970's and 80's. It became customary for the SA Open to be held in even years, with the South African Closed being held in odd years. The event returned to the Wilderness in 1964, before moving to Durban for the first time in 1966. The entry fee was R5.00 and only 64 players could enter, due to the size of the playing venue. I recently discovered the detailed pairing charts for 1966 and got quite a surprise when I recaptured all the pairings. As you can see, in the first round all of the higher rated players got the Black pieces! Normally the odd numbered seeds get a different colour from the even numbered seeds, but the pairing system used meant some winners got a second Black in round 2. The poor top seed, David Friedgood, actually started with 3 consecutive Blacks. 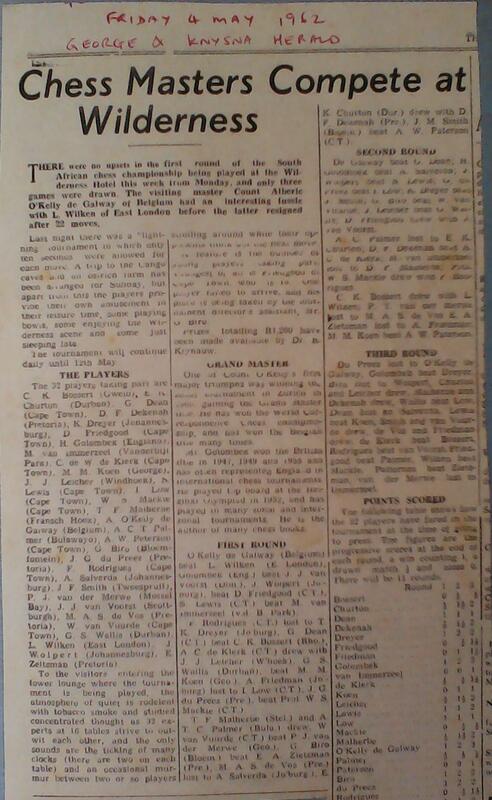 The 1966 open was won by the 10th seed, Bob Griffiths, who defeated the Durban champion, Gerald Boulle, in the last round, to the dismay of local chess fans. A total of R900 in prize money was awarded at a closing cocktail party at the Edward Hotel. The prize fund of R900 doesn't sound like much, but it would be worth about R67,000 in 2017 after taking inflation into account. Incidentally, when I was paging through some old chess magazines, I found an entry form for the 1972 open, which was held in Port Elizabeth. You could enter the tournament for R10.00 and get a hotel room for less than that per night! The next SA open to be held in Durban was in 1974. I was still at school and had no transport, but I was able to watch one of the weekend rounds. About half of the 146 contestants were from Natal. Top seed was Nigel Bloch, rated 2230, but none of the other members of the SA Olympiad team played. They were probably still traumatised from the Nice Olympiad held the month before, where both South Africa and Rhodesia were expelled from FIDE. The South African team decided to forfeit their last 3 matches at the Olympiad in protest at being expelled from FIDE, and had their score in final group C annulled because of this. The Olimpbase website contains an interesting extract from Keene & Levy's book on Nice 1974. Despite the expulsion from FIDE, South Africa was still able to host some visiting masters. 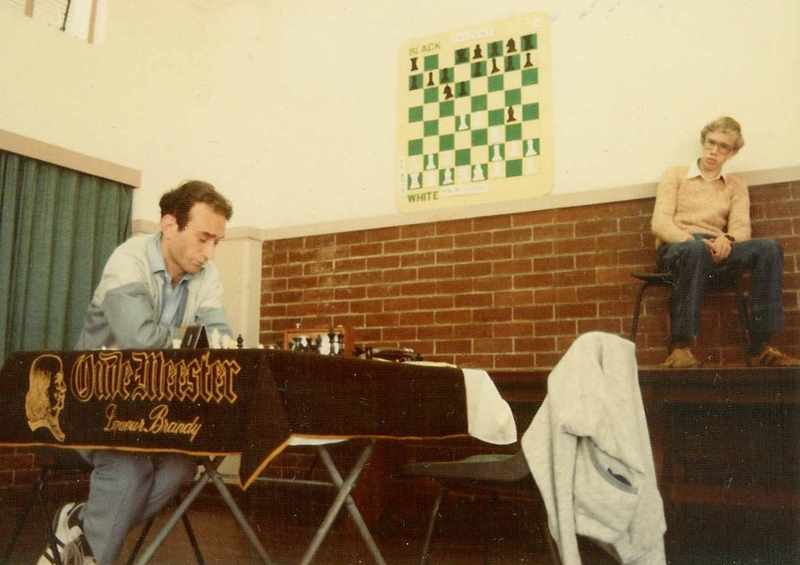 Cape Town 1976 saw the event dominated by visiting GM's Miguel Najdorf and Michael Stean. The same thing happened in Durban 1978, when we hosted IM's Craig Pritchett and Raul Sanguineti. This was my first SA open and I lost to Pritchett in round 4 after cheekily playing the Scheveningen against him (he had just written a book on this opening) and to Sanguineti in the last round, to end up on 7.5 points, tied for 8th place. Durban's Peter Abbott was the best South African player, finishing in 3rd place. RSA Open Durban 1978 (incomplete, 472 games). The next SA Open in Durban was in 1984. I had a disappointing tournament, scoring the same as in 1978, and did not get to play against GM Stean. There are some pictures from 1984 above. 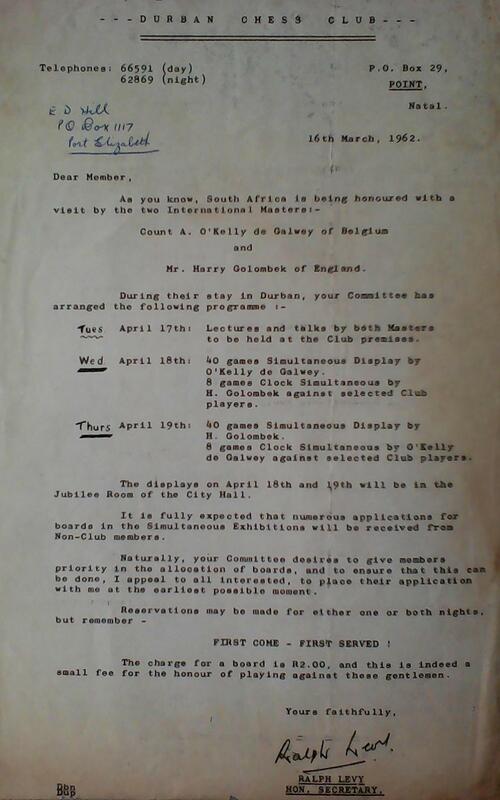 No game scores are available for the 1984 event, other than those already published in the Durban Chess Club Bulletin. After meandering from Johannesburg in 1986 to Port Elizabeth in 1988 and back to Johannesburg in 1990, there was no event in 1992. Chess in South Africa was in considerable turmoil in 1992, with several competing bodies attempting to form a unified structure. These talks resulted in South Africa being readmitted to FIDE, but the SA Open had to be held over until 1993. The 1993 event happily co-incided with the celebrations for the centenary year of the Durban Chess Club. Overseas visitors in 1993 included IM's Malcolm Pein, Johan van Mil, Gerard Welling and Erika Sziva, but it was Cape Town's George Michelakis who won the event on tiebreak from Pein, and shortly thereafter became an IM himself. Again I scored 7.5 points, as I lost to Michelakis in the last round. I also lost to Pein, in round 5, who liked our game so much that he published it in his English newspaper column! RSA Open Durban 1993 (complete, 919 games). RSA Open Durban 1995 (complete, 797 games). RSA Open Durban 1996 (incomplete, 509 games).